If you have an opportunity for a visit to the oldest town in Tennessee, that is Jonesborough. I suggest going during the first full weekend in October when the Storytelling Center holds the National Storytelling Festival. It’s a big and wonderful event that draws storytellers and people from around the globe. One of my favorite stories comes from this festival. 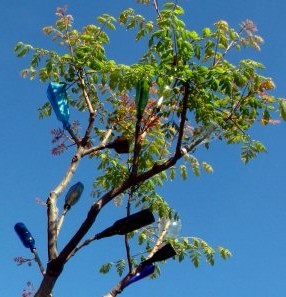 The Blue Bottle Tree. There are many stories about blue bottle trees. Perhaps because this is the first one I ever heard makes this one my favorite. Or possibly because the main character in the story share’s my last name. This isn’t an exact version of the story I heard early in the 1970s. But rather this is how I remember that story and how I tell it today. I hope you like it. Anne Carey was a young girl who lived just outside this old town of Jonesborough Tennessee. She was a very curious little girl who loved to venture off in the foothills of the great Smokey Mountains. Running beneath the trees and amongst the animals who lived there. One late summer afternoon Anne found herself along side a small creek and she began picking out lovely river stones from its water bed. Sifting through the dirt she came across a strange button that shimmered in the late afternoon light. She dropped it in her pocket and headed home before the sun set behind the mountain. Back at home Anne was sitting by the fire in the modest cabin she shared with her Mom, Dad and younger brother. She began emptying her pocket and showed each rock to her family, telling them a story about the stone she had found. This one was a tear drop from the Water Spirits of the river. This one was the heart of an evil witch that had been drowned in the water. This one was a piece of blue sky that was stolen from way up in the clouds by a black raven. And then she came to the button. Anne had almost forgotten about the button. But she quickly told the story of a young soldier who had gotten so scared of battle that he ran away and was shot for cowardice and dissertation. 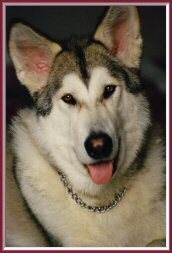 Late that evening the family was awakened by a horrid scream and the rattling noise of chains. The cries of horror were so frightening they each shivered in their skin from fear. As Anne’s father looked out the window and a small pebble hit the glass and startled the entire family. They huddled together in the fading light of the fireplace when suddenly a larger stone hit the window and broke it clean open! The noises and screams outside continued through the night, keeping everyone from a wink of sleep. But as the sun rose, Anne and her brother finally found some peace and fell into dream. Later that morning Anne’s Mom woke her children for the day. Over breakfast Anne told them that she had been visited in her dream by the young soldier whose button she had found. He told her the witch had come to take back her heart and they were all in great danger. But they could be spared if they placed the heart in a blue bottle and placed the bottle on the limb of a Crape Myrtle tree in their yard to ward off the evil Witch. Her family thought the story was entertaining, but dismissed it as one of Anne’s made up tales and didn’t heed it’s warning. That night, once again the frightening screams returned. The rattling chains and the sounds of stones and pebbles being thrown at the little cabin filled the night air. This time, someone banged at the front door and gave them all such a start! But when opened, no one was there except a shrieking voice that would have pushed any Church going person straight into the hands of death himself. For four nights it was the same thing over and over again. Each night the screams would be louder, the knocks would be harder and the items thrown at the tiny house would get bigger and more dangerous. And each morning Anne would plead with her Mother about the soldier who came to her dreams and warned her of the evil witch. Finally Anne’s parents gathered 6 blue bottles and hung them in the crape myrtle tree by the front gate of their modest little homestead. In one of the bottles, Anne placed the little red river stone that she described as the witch’s heart. That night, the family was awakened by the same screams and they each thought the bottle tree was useless and didn’t ward off the evil spirit. But as they arose from bed to check on their tree, the screams suddenly stopped. They each looked out the front window and they saw a light bouncing around inside one of the blue bottles they hung in the tree. It was the bottle where Anne placed the stone heart. All during the night, Anne’s father kept watch on the light in the bottle bang on the sides from inside its glass surroundings. Never wavering his stare, he watched through the darkness and listened for the horrifying screams. But they never returned. Nor did the pebbles and stones that had been thrown at the house for the past four nights. Finally the sun began to rise and its shining glow fell upon the bottle tree. The struggling light inside the bottle seemed to freeze as the warmth from the sun blasted the blue glass. 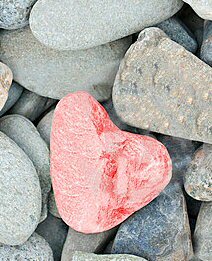 Within a moment the evil vanished within the bottle and so too did the little stone heart. Anne and her family never heard the evil screams and violent attacks on their tiny home again after that morning. Today’s Anne’s bottle tree can be found in yards and gardens all over the south. Warding off evil spirits and keeping families safe during the long dark nights. You can learn more about the History of The Blue Bottle Tree and find information for making your own tree in your garden, yard or patio.